As Australia’s Energy Minister’s gathered for a panicked attempt to keep the subsidised renewable energy scam rolling for just that bit longer, the Wind Gods conspired to deflate their pumped-up rhetoric about Australia’s ‘inevitable transition’ to nature’s wonder fuels: sunshine and breezes. 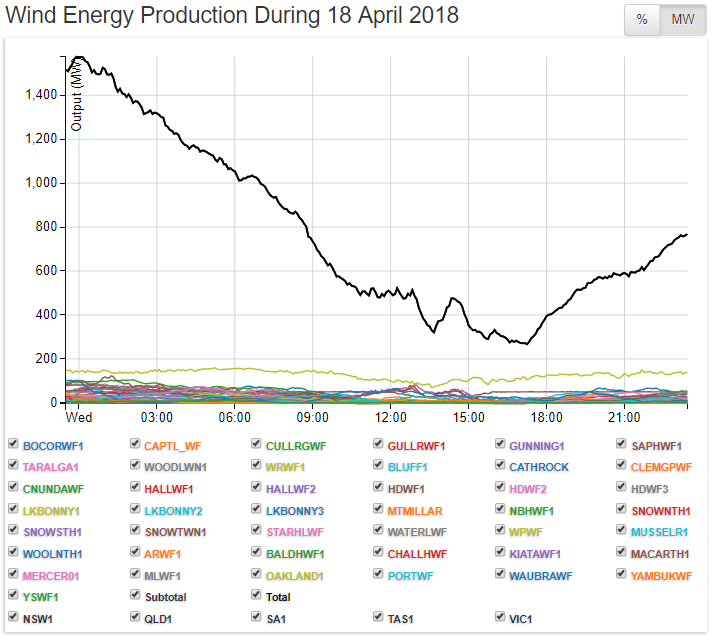 What’s depicted above, courtesy of Aneroid Energy, is the output from every wind turbine (with a notional ‘capacity’ of 4,675 MW) spread across four states and connected to the Eastern Grid on 18 April. Here’s Terry McCrann taking the wind out of the wind cult’s sails (with a little more help from STT and Aneroid Energy). Are we completely insane? Well, almost our entire political class and the overwhelming majority of — self-believing — “clever people” seemingly certainly are.